Inn on the Lake is a popular wedding venue, located in the heart of The Lake District alongside Ullswater. The daytime reception is held in the main hotel building, and the evening reception is held in the adjoining ‘Ramblers Bar’. I have played at Weddings there for many years, but this was my first visit since the opening of an impressive extension and refurbishment. The extension provides an additional room alongside the original bar, which is called ‘The Candleroom’. It has large windows and feels very spacious and modern. I was pleased to see the entrance has also been relocated, so now much easier for me to carry my equipment in and out. Holly and Wayne brought their family and friends up from Burnley in Lancashire. They booked me to DJ at their wedding over a year ago, having read my good reviews online. They were blessed with a beautiful warm and sunny Saturday in May for their wedding. Their first dance was a past favourite of mine, which I rarely get to play now, Dream Catch Me by Newton Faulkner. It’s fairly upbeat for a first dance, so I mixed straight into Uptown Funk and got the dance floor rocking. The bride and groom placed their trust in me to play a good mixture of different music for their guests. They had sent me a short list of some of their favourite tracks, which included Guns n’ Roses and Greenday. I saved these for later in the evening. Greenday’s Basket Case went down particularly well, and I had a moment of panic trying to select something suitable to follow it. With seconds to spare, I choose Blink 182, All The Small Things, and I got huge satisfaction as the atmosphere and energy level rose another gear with cheers, hand-in-the-air, and singing loudly. 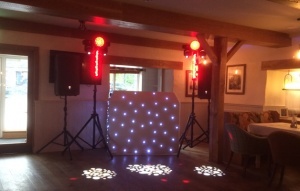 Are you searching for a reliable DJ with a professional disco set-up, and the experience required to ensure your wedding evening reception is a big success? Please let me know your wedding date, by completing this short enquiry form. I will check my availability and email you a quotation.